Hello there, first of all I wanted to say a big thank you to everyone for their messages and those who have sent cards, they are so appreciated. I managed to make a card on Monday which was lovely to do after all that has happened, nice and calming. I wanted to make a card for the Less Is More Challenge of Shades of Blue. I know there is not that much white space on the card (sorry Chrissie & Mandi) but I do still feel it's clean and simple and hope you agree! It is inspired by the very telented Nichole Heady. I have used Papertrey Ink Beautiful Blooms 2 dies for the flowers, one cut with felt and added a circle cut from card and then glittered. The leaves are from the MFT Die Namics Upsey Daisy Set. 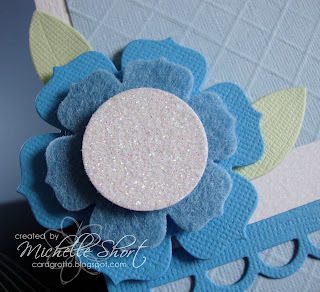 The border under the sentiment (Papertrey Ink Birthday Basics) is an MFT Die-Namaic Little Open Scallop Border die cut from Bazzill Ocean CS. The embossing on the SU! Bashful Blue CS I have done with my Martha Stewart Scoring Board. Gem stones added to finish. STAMPS: Papertrey Ink. INK: Memento Tuxedo Black. 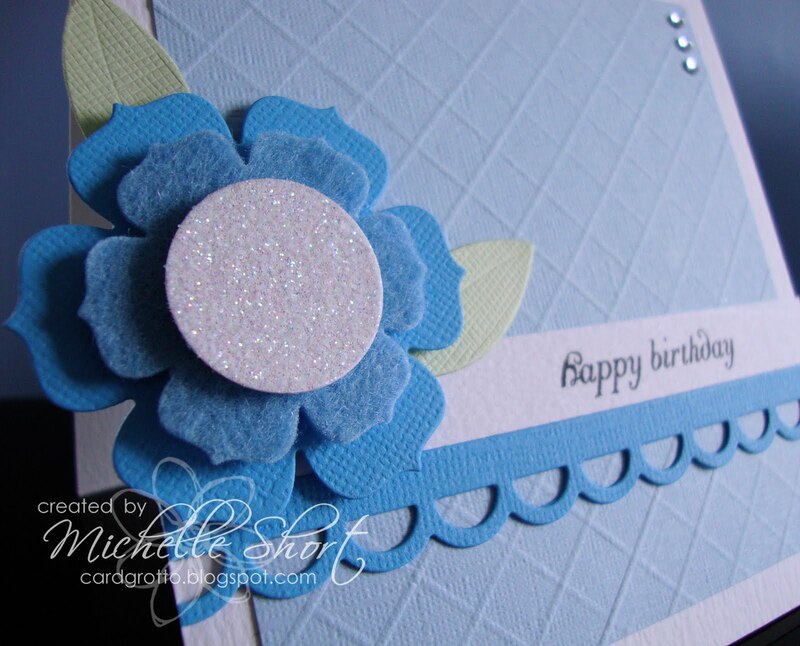 CS: Craftwork Cards, Bazzill Basics, Doodlebug Designs, Stampin' Up! TOOLS: Papertrey Ink Beautiful Blooms 2 Dies, My Favourite Things Die-Namics Little Open Scallop Border Die, My Favourite Things Die-Namics Upsey Daisy Die Set, X Cut Circle Punch, Martha Stewart Scoring Board. 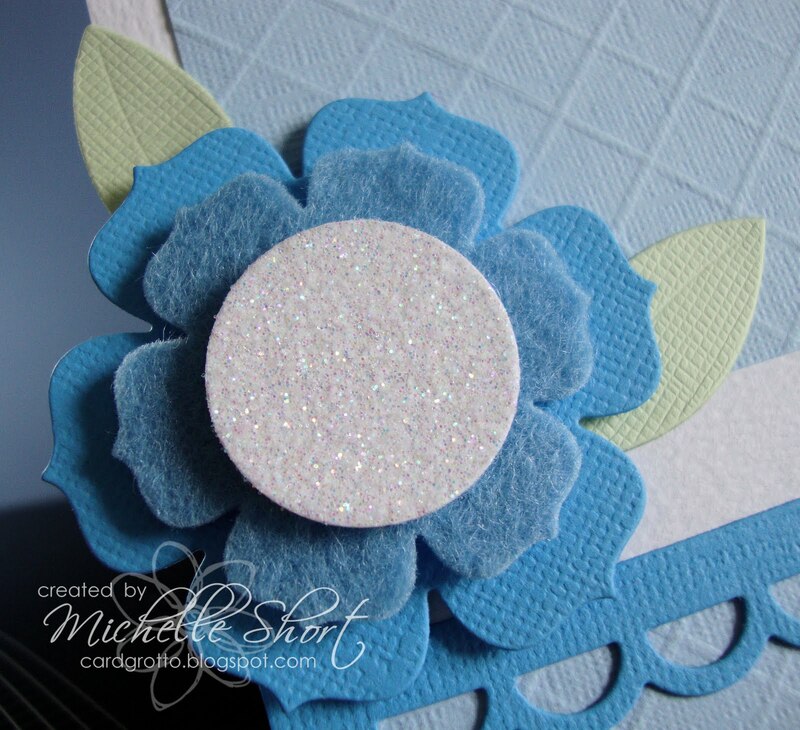 EMBELLISHMENTS: Doodlebug Designs Sugar Coating Glitter, Doodlebug Designs Mini Jewels. Totally adore your card! Especially your glittery flower centre!! I love your CAS style card! So nice and so elegant! Fantastic card! So clean and elegant. A really clean beautiful design Michelle. A lumbar puncture sounds painful - good luck with that! Love the blue on white! 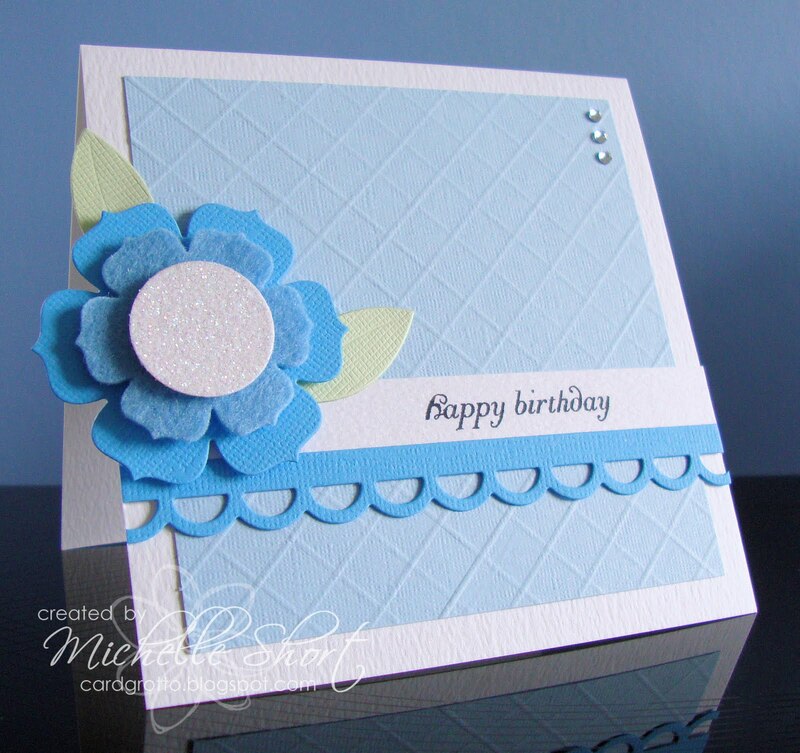 Very subtle and I think your card fits the 'Less Is More Shades of Blue' bill perfectly!